This weekend was the CQ World-Wide WPX CW Contest, the second largest CW contest of the year and I decided to give away a few points and perhaps try and pick up some new DXCC entities on the way. I’m still not fully proficient at Morse so this was never going to be a serious entry and would consist of me working search and pounce (S&P) while looking at a DXCluster feed to see what’s out there. 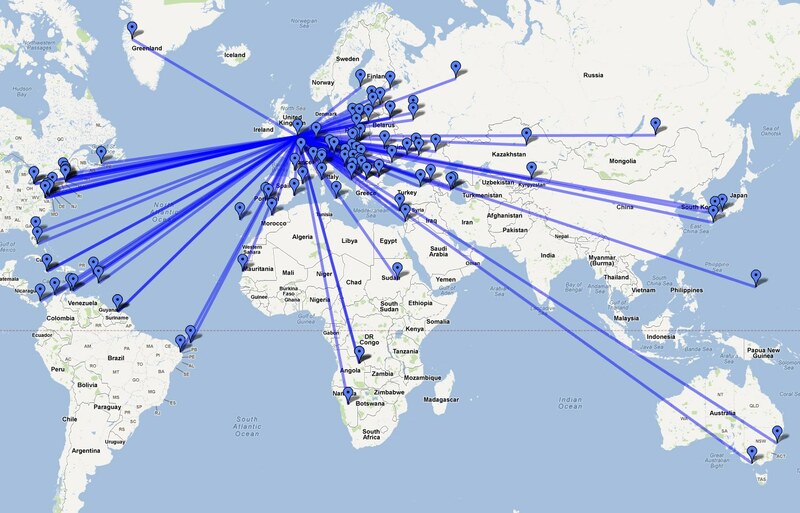 In the end I worked exactly one hundred stations contest stations and three non-contest stations which included four new DXCCs, these were Mauritania, St. Kitts & Nevis, ITU HQ Geneva and Jamaica although the first two were worked on 17m and therefore not part of the contest. I also picked up quite a lot of new band slots for countries I’ve worked before so all in all, the weekend was a success for me. I’ve exported all the stations I worked into a map and so here it is (click for a larger version). I didn’t go out of my way to work any more south American stations because I’ve got them on most bands already. I’ve worked out my claimed score at 18,720 which really isn’t very high but I’ve submitted it anyway. All logs help when it comes to scoring and it can’t hurt to see how accurate my log keeping was. Here’s a breakdown of my QSOs. I was concentrating more on 20m as that’s the band I’m working on now for my next DXCC. I did very little on 40m because although I was working on my 40m aerial all Saturday afternoon, I’m still not happy with the performance. The Hexbeam performed perfectly though and I’m happy with what I worked over the weekend. This entry was posted in Amateur radio, Contesting, CW, New DXCC and tagged CQWW. Bookmark the permalink.